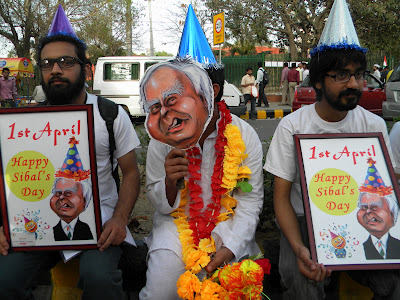 Newsclick is joining other activists and websites in wishing Kapil Sibal a happy April Fool’s Day. Not because he is being foolish in trying to censor the net, but because he is being too clever by half. Which amounts to the same thing. Sibal is one of country’s leading lawyers and as the Minister of Information Technology, we would have thought the right person to create an enlightened legal framework for the Internet. But instead of taking the high road — what is an appropriate legal regime for the Internet which would allow the growth of new media and new Internet business models, Sibal chose to take the low road — how can the ruling party police the net in its own interest. This is what explains his calling various Internet platforms and Social Media sites and asking them to take down material that is derogatory to the Congress leaders; or else. If we believe the newspaper reports, his message was frank and brutal. Here is material on the net for which we can “get” you and here is material that we do not want. And here is the quid pro quo, take down one on your own what we don’t want and we will protect you on the other. If you don’t, we will see you are in trouble. Of course we all know that Internet has material that violates Indian laws. Some of it is legal in other countries. The power of Internet is that it is one common cyberspace, the net does not fragment into Indian net, the Chinese net, the US net and so on. If we want the net to obey only our laws, it means creating an Indian net and seceding from the rest. Something the Chinese seem to be trying, though with only limited success. So here was an opportunity — create a legal regime for the net which would allow its current free character and yet take out or block material that we consider illegal. If India wanted to go down this path, this would have been indeed welcome. And it would have joined a number of countries that are grappling with this very issue. Sibal chose to take another path. He thought that the ambiguity of law that exists on the net could be used to the advantage of the ruling party. The Internet platforms — social networking sites, Google and its search engine, blogging sites — are all intermediaries. They and the Internet Service Providers (ISP’s) provide our access to the net. So if he could make these players carry out his wishes, he could create a China like Internet without the Government having to do anything — the Internet platforms and ISP’s would do it for him. A Chinese model of control with a distinctive Indian twist — the markets could be used to do the Government’s bidding — private censorship carried out at Government’s behest. Google and Facebook are there for making money from their users. For them, every user of their platforms are “products” to be sold to advertisers. This is the same as the Television channels — more the eyeballs more the advertisers are willing to pay. So Sibal’s calculation was given the size of the Indian market, these players would cave in and privately censor the net for him. Freedom on the net is not what drives the Internet platforms — they have their business to protect. The problem for the Internet platforms is that what Sibal is asking is completely arbitrary — how will they as private parties take down material that Sibal might think is bad? Who would tell them to take down material and how would this be communicated?And if they accept this for India, would they in turn have to do it for other countries as well. They would have to develop country specific tools — for example no general search engine but only a country specific one. A regime that would not work in the long run even as a business. For them, the operational difficulties make such a regime unworkable. Sibal and his net czar, a Gulshan Rai in the Department of IT obviously believe all this is easy. It is in line with a similar understanding that Pakistan Government has — it has recently advertised for a software tool that is capable of filtering out up to 50 million Web addresses in multiple languages with a processing delay of one millisecond. In other words a godlike censor! What Sibal is trying is that all ISP’s Internet platforms does what Pakistan Government wants but at their own cost. Leaving aside who develops it, is such a filtering scheme feasible? This is where technology has to meet law — we need a legal regime that understands the limits of technology. Not one where we say this is the law as we see it and technology can go hang itself. All new technologies create new legal issues. The legal problems of the Internet is the result of new digital technologies..The Internet is new and so is user generated content. It has created a scenario in which we no longer need mass media to reach the people. If the message strikes a resonance, the people will amplify the message. It is not the only area — copyright regime is also affected by digital technologies. We either modify the laws or create new laws to deal with such issues. This is the only sensible option a country has today. An option that Sibal did not exercise. That is why we are all wishing him a Happy April Fool’s Day.